Some articles will by and by be translated into English. Do you want to improve your riding? Are you prepared to analyze movement patterns, gaits, sometimes even footfall patterns and lessons in detail? To look closely, listen carefully, to analyze, research, to try on foot, to correct until you manage to create body awareness very clearly and well within a lesson? Would you like to develop a feel for relative lengthening before you begin to collect yourself in relative elevation? And all of that before you even get on the horse? Riding in Strides 1 – Learning Step By Step! Is rising trot really rising to the challenge – And is sitting trot only for couch potatoes? Hay nets are a good means to feed roughage in a way that keeps horses busy for longer. But there are other ways and other products on the market, too. Hay bag "Little Bit" - road tested by Karen Diehn. DVD If Horses Could Speak / Dr. Gerd Heuschmann - introduced by Barbara Schnabel. Basic Feed Requirements – by Ingolf Bender, an advising biologist and author for Kosmos, long standing health practitioner and ethnologist and rider. When it comes to tall people on small horses the opinions are split, from ‘can’t be done’, to ‘totally o.k.’ Does the physical leverage of a rider who is 185 cm (6 foot) tall not constantly throw a pony with a height of 135 cm (4,5 foot) off balance? Is it even possible to ride according to classical principles in this situation or should other rules be used? Of Giants on Dwarves – by Tina Pantel / Translation: Christiane Soeffner. 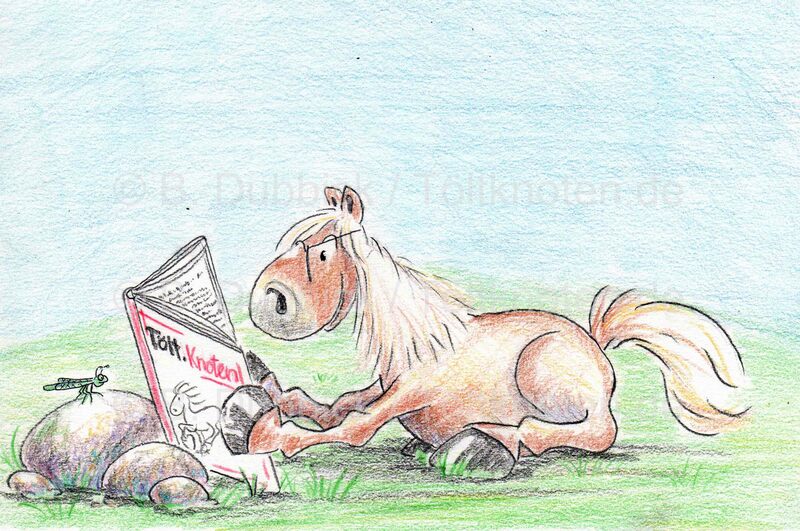 The Tölt.Knoten Interjection to the World Championship for Icelandic Horses 2011. By Ulrike Amler. Translation: Christiane Soeffner. The seat in tolt. Playing with the balance. Get on, tolt on, have fun – sounds like a ‘how to’ manual for driving a motorcycle. However, the casual ‘Harley seat’ is a relic from the pioneer days of Icelandic horses. These days the seat is ‘normal’ in tolt. Also, there is no magic formula to enjoying the four beat; ‘riding correctly’ is enough. By Tina Pantel. Translation: Christiane Soeffner. Tolt, pace, piaffe - Icelandic horses don't need dressage; they need wind in their manes. "Sandbox riding" has been a "no go" for tolting horses for a long time. Now changing to a classical trainung system is being discussed even in the highest ranks of the association, because riding well opens entirely new horizons especially for riders of gaited horses. By Tina Pantel. Translation: Vanessa Waldrum. Kottas on dressage - The Spanish Court Riding School in Vienna is probably the most famous venue where the art of classical riding is practiced and preserved. Arthur Kottas-Heldenberg was one of its students and rose to the rank of first senior rider. In his book Arthur Kottas-Heldenberg gives the reader important insights into the teaching and training methods of the renowned Austrian educational centre. Introduced by Ulrike Amler. Translation: Christiane Soeffner. The first round of breeding show qualifications for the world championship in St. Radegund is over with the meetings of the South, Centre and North of Germany in May. Tölt.Knoten Interjection - by Ulrike Amler. Translation: Vanessa Waldrum. Take the time - An interview with the former senior rider of the Spanish Court Riding School in Vienna, Arthur Kottas-Heldenberg. The questions asked Ulrike Amler. Translation:Christiane Soeffner. Freedom for the Icelandic tongue? Some time ago, a forgotten bit resurfaced and it is becoming quite popular in the Icelandic Horse Show World: The Icelandic bit as a curb bit. By Dagmar Trodler. Translation: Yvonne Eberling. The dream of flying - What' so difficult about the tölt? Effervescent motion, a cheerfully nodding head – freedom and elation. This is what we envisioned, as we fulfilled our dream of having our very own Icelandic horse. However, the reality turns out to be quite different. By Dagmar Trodler. Translation: Tony Pilz. Handling!? A comment about the German Icelandic Horse Championships 2010 in Lingen by Dagmar Trodler. Translation: Yvonne Eberling.